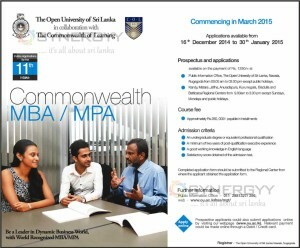 The Open University of Sri Lanka in collaboration with The Commonwealth of learning offers Master of Business Administration and Master of Public Administration degree programme. The application calls for the 11th intakes of Commonwealth MBA / MPA degree which highly demanded by Public and private sector. Public Information Office, The Open University of Sri Lanka, Nawala, Nugegoda from 09.00 am to 03.00 pm except public holidays. Kandy, Matara ,Jaffna, Anuradapura, Kurunegala, Badulla and Batticaloa Regional Centers from 9.00am to 3.00 pm except Sundays, Mondays and public holidays. Completed application form should be submitted to the Regional Center from where the applicant obtained the application form. Prospective applicants could also submit applications online by visiting our webpage (www.ou.ac.lk). Relevant payment could be made online through a Debit / Credit card.